Jane Fonda hosts Homeboy Industries 2019 Lo Máximo Awards Dinner at JW Marriott Los Angeles at L.A. LIVE on March 30, 2019. 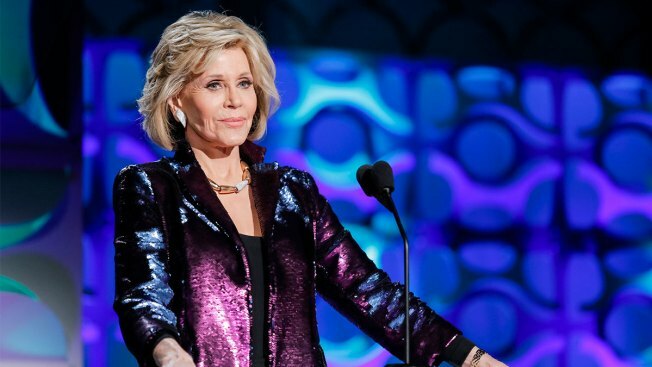 Jane Fonda is opening up about her recent health battles. While the Hollywood actress prefers to keep her private life private, the 81-year-old is shedding some light on her battle with cancer. "I've had a lot of cancer," she shared in the upcoming issue of British Vogue. "I was a sun-worshipper. When I have a day off, I frequently go to my skin doctor and have things cut off me by a surgeon." In the candid interview, Jane also recalls her appearance at the 2016 Golden Globes where she was nominated for Best Supporting Actress in Youth. Jimmy Fallon and Cole Sprouse team up against Lily Tomlin and Jane Fonda in the game Password. While her red carpet outfit may have looked glamorous, Jane was struggling with health problems behind the scenes. "I get out of the car and I have the strange white dress with all the ruffles? That's because I'd just had a mastectomy and I had to cover my bandages," she shared. When asked what her diagnosis is now, Jane replied: "It's an ongoing process. So there's that." Back in January 2018, Jane was promoting the fourth season of her Netflix series Grace and Frankie when she revealed in interviews that her doctor removed a cancerous growth from her lower lip. The actress would also address the procedure on Instagram with her co-star Lily Tomlin. "With Lily in NY," she wrote online to her followers. "I've found a clever way to disguise my lip bandages from removal of cancer." Ultimately, the actress remains a force both in and out of Hollywood. And when it comes to her love life, let's just say it's not a priority at the moment. "I had several serious relationships after [Ted Turner], but I can't..." she shared with the publication. "That is my failing. I realize I can never overcome it. That when I'm with a man, I give up myself." British Vogue's "non-issue" issue in partnership with L'Oral Paris is available on digital download and on newsstands April 5.